Pure Water Vision: Acea EcoArt Contest. A CSR and brand activation partnership. Acea Group is a leading multi-utility company providing water and energy in Italy. The company is also involved in the waste management and production of energy from waste disposal, renewable energy, public artistic lighting, and integrated water services (sewer and water treatment). 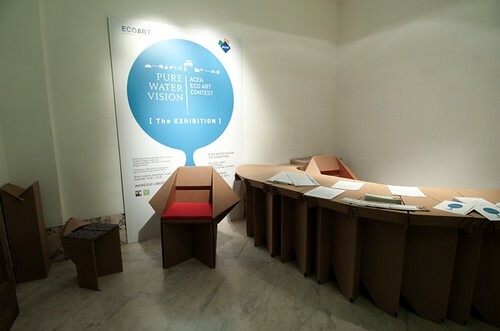 The Acea Group was the title sponsor of Pure Water Vision, which has been dubbed the ‘Acea EcoArt Contest 2010’. We were asked by our sponsor to produce a creative campaign that would gather the attention of the public, specifically regarding Acea's effort in the technological cycle of water. We decided to dedicate the entire EcoArt Competition to the relationship between water, man and environment. More specifically, how these elements are strongly connected to the sustainable development of the planet: water pollution, water as a source of life, water as a renewable energy source, the process of desertification and the water emergency. The aim was to highlight little-known aspects of the water cycle by stimulating, through art and metaphor, a series of reflections on what’s behind the apparent simplicity of the element of water: what happens before and after the distribution of this precious resource that flows through the taps in our homes, following a journey through springs and aqueducts, only to end up in sewers and sewage treatment plants. More then 600 artists entered the competition. We published the EcoArt Book 2, produced the Pure Water Vision Exhibition, and awarded the Acea EcoArt Prize of €10,000.00 to the winning artist Dacia Manto. With Pure Water Vision and all related communication campaigns on social media, advertising, publications and the help of media partners, we reached an audience of more than 2 million people.